Hello!! This is my FIRST ever blog waltz, how exciting!! 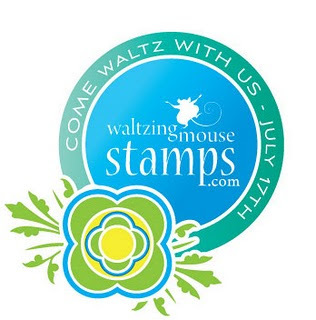 The Friends of Waltzingmouse Stamps Blog Waltz theme is the colors of summer... BLUE and GREEN (any shades you like!!) I can't wait to see what everyone comes up with. So without further ado, here's my creation!! I decided to make a large tag shaped card, handy and pretty to attach to a gift! I went for a fairly soft palette of blue green, petrol blue and a soft turquoise blue, well it kinda all blends together! The green base card is from the Mariposa Stack DCWV, the dotty paper is The Thrift Shop (October Afternoon) and the pretty floral paper is a gorgeous digi paper from a set called Girlfriends by Nicole and Mari (Sugarplum Paperie) at The Digichick. Of course I used some of the very beautiful Victorian Fripperie set by Waltzingmouse stamps (my favorite stamp set!!) to stamp along the bottom of the card in green. I used a little more of the digi paper to make the little circle tag and I stamped the circle and sentiment in the same green. I ran a little stitching around the edges of the card on the sewing machine. To add a little extra something, I sponged the edges with some Creative Inspirations Paint in Sage, it softens the edges nicely and catches the light nicely (It always goes well with a bit of satin ribbon too). I didn't have any blue lace (who does?) so I painted some white lace with a bit of Sky Blue Creative Inspirations Paint, turned out pretty. The flower I made from some plain green fabric (from my mom's stash! ), it's a Kanzashi flower, I have used them on my cards before. They're not too hard to make once you've made a couple. I have a book 'Kanzashi in Bloom' by Diane Gilleland, there are great tutorials in it for all different styles of kanzashi flower but there are some good video tutorials online too! I backed mine with a little circle of card to make it easier to attach to the card. The buttons are from my 'big bag o' buttons'! I did paint the top button with Sky Blue around the rim. I layered some lace, blue organza and a bit of blue embroidery thread behind the flower. Ok, I didn't intend to have such a long post, I just got carried away! Enjoy the rest of the blog waltz!! Other: Creative Inspirations Paint in Sage and Sky Blue, hole punch, blue embroidery thread, petrol blue satin ribbon, pale blue organza ribbon, selection of lace, sewing machine, green fabric, buttons. Great job, glad to hear someone else was hopping along on their first waltz too. Beautiful tag! lots of detail.....love your hand made flower....must look into those. Enjoy the hop. Very nice tag, love how you made the flower! Outstanding, Clare. Love that beautiful flower and your lovely shades of green really bring this tag to life. Oh wow! This is just gorgeous!! Love it!! This is a beutiful creation...and I'll search for those K------ flowers too...this flower is wonderful. The colours are simply great. Beautiful Claire! Such a gorgeous tag and that flower is too lovely! Your tag and flower are so beautiful. I have to go do research on the tutorial on how to make that fabulous flower. One more thing to add to my crafty knowledge! Beautiful tag! Thanks for the info on the Kanzashi flowers. Must have a go at them. Yours is so gorgeous. thanks for the inspiration. Beautiful, beautiful tag card!! Your flower is gorgeous!! Gorgeous tag- I love the pretty colors, love the stitching and love the lace and flower you added. I LOVE your tag Clare! what a wonderful look! your flower is so pretty - have to check out that Kansashi technique! I love how you stamped the fripperie along the bottom and your lovely ribbons. So glad you waltzed with us today! Congrats on your first Waltz! This is a gorgeous tag, just lovely! The flower is wonderful...I've got to check out the technique now! such a beautiful tag and the use of the stamps look as though they were already on the paper. thw flower is amazing. I love the colors! that is beautiful! The colors you chose are beautiful and I love the flower! I just looked at a tutorial and they do not look easy! Great job!! This is so beautiful! I am now following you, because your work is so gorgeous!! Clare, this is absolutely gorgeous in every way! All your fine details make this a very special tag/card. And I'm definitely going to give those flowers a try! Such a beautiful tag. And your fabric flower is just gorgeous! So lovely! Very nice! I LOVE the flower. And I just love the Fippery border too!! LOVELY! So pretty...everything is just perfect about it! Love the flower you made! Great job! I love it !! the flower is just gorgeous! What a wonderful creation. That flower is gorgeous! I think the color combination is beautiful! Love the flower--it looks hard to make. Perfectly beautiful! I've never heard of Kanzashi flowers before but I'm certainly going to look them up after the hop. Thanks so much for sharing your lovely project. enjoying the blog waltz, thanks for all the comments! The flower is not too hard to make, once you've made one it gets easier. Each petal is a square of fabric, folded similar to origami, ironing the folds keeps the lines crisp. Each petal is then strung together with a needle and thread, tied at the end and then a circle of fabric is glued to the back to stabilize it. You can top it off with a button or whatever you like. I know pictures would help. I'll try and find a tutorial and post a link. absolutely love how this all came together and your tag idea is brilliant. OK, now i need to make this flower! lol, your tag is simply gorgeous!! Thank you so much for waltzing with us @ Waltzingmouse Stamps! Love your greens and blues, and that awesome flower! Thanks for posting the link to the tutorial! I love everything about this card! I've been hearing a lot about these Kanzashi blooms. Guess what I'll be doing tomorrow?! This is just simply all kinds of beautiful. Thanks for the link to the flower how-to. Very cool flower!!! This is such an awesome creation. Love it! This is gorgeous!! And that flower is to die for! Wow, wow, wow!! I love everything about this card/tag. You are one creative lady. Lovely tag and an even more beautiful flower - thanks for sharing a new technique! Absolutely gorgeous tag card! So pretty! This is a fantastic tag, Clare! All the details really make it outstanding. I'm so glad you were able to waltz with us this month!! Absolutely beautiful, and that flower is STUNNING!! !